Today's Draw: The Chariot from Tarot of the Crone. Is something deterring you from your true path? Do you know what your true path is? Are you willing to give up self-criticism to be happier? The text that comes along with this card says, "I may be burned, but I survive. Now I fly to a new adventure." This card is about putting adversity aside and following your own star. Sometimes we suffer a physical setback. Or an emotional one. Or an ego-based one. But the only way to carve out our freedom is to keep moving forward despite all that. The Chariot asks us to set our own reality...to move in the direction your heart pulls and not worry about what others think. It's the worrying about what others think that holds us back and keeps us from truly being free. Each of us has a special magic within us and no one wins when you hide that inside. Admittedly, some of us have a hard time identifying that magic or path. But if you find yourself wishing you could be another way, that definitely holds a clue (assuming it doesn't lead to a life of crime). I can't count the number of times in my life that I've spent time hiding inside myself for one reason or another. It not only breeds depression, it holds me back in the things I want to achieve in life. There's something going on now and I want to beat myself up and hide from it. It's something that's tripped me up before. Honestly, I don't know how much we can think about the same issues over and over again in our lives. It just doesn't get us anywhere. So this time I'm choosing a form of denial...haha. It's not real denial, because I acknowledge it. And I'm definitely not one to hang out in denial, preferring to, as I said before, abuse myself with uber-reality. But this time, I've seen myself tempted to go down that path and I'm just not going to do it. I know the outcome. It's fruitless. 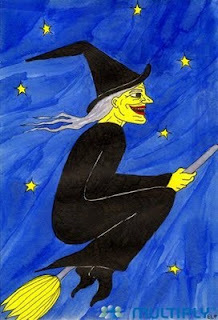 Instead, I'm going to keep flying forward like the witch on the broom and follow my inner star. I don't like everything about me, but I do like who I am. And I'm not going to let that suffer for the things I'm not able to change at this moment.